It’s a sad fact of life that sometimes we only get to know a person after their death. Funerals can be revelatory affairs. I’ve been to a fair few in the past year and have always come away knowing far more about the person whose life we were celebrating than I did when they were alive. Admittedly, those same funerals have been for friends I’ve only known through shared interests, societies or classes, and thankfully not those of close family or friends, but it’s still made me think about how much I know anyone in my life, whether family member, close friend or acquaintance. Stephanie Butland’s debut novel, Letters to my Husband, asks this same question about the person we’re closest to: our partner, spouse, husband, wife, significant other, whatever label you attach. Mike may have physically drowned but I don’t think I’ll be the only reader to get the sense that Elizabeth is also drowning in her grief. Initially this makes her distant and difficult to know, unreachable as she is, and I felt as if I was watching her function in a water tank. She’s not alone in having to come to terms with Mike’s sudden death, but she certainly feels isolated in her grief. Not least because she’s the outsider here, having crossed oceans and left behind her life in Australia to move to England and live with Mike in his hometown. If you’ve ever lost anyone dear to you, you’ll have some sense of what Elizabeth is going through but we all grieve differently. What opens her up to the reader are the letters she writes to her dead husband. She’s not going crazy, she knows that he’ll never read them but they’re her way of making sense of her new state, her coping strategy. Without these letters we would only see her lash out and snarl at those trying to help her while dealing with the shock of Mike’s death themselves. Or we would see her retreat into an impenetrable shell without having any real sense of what she is going through and, more importantly, what she’s thinking. The letters are a clever device which transform what could easily have been a depressing or mawkish read not only into an engaging and moving novel but ultimately and, surprisingly, an uplifting one. Watery images seep through the pages of this novel and it’s something I really enjoyed about reading Letters to my Husband: Elizabeth’s feels herself slip underwater as she tries to deal with Mike no longer being there: to her, other people sound distorted as they do when you’re submerged in a swimming pool, water clogging your ears. As I mentioned above, I felt as if I was watching newly-widowed Elizabeth move about underwater, muted, in slow motion and with a clear barrier between us until she starts writing. Letters to my Husband is an interesting debut but it’s also one that stays with you thanks to Stephanie Butland’s fine writing. She’s writes beautifully, delicately about grief, and deals with it compassionately, but she’s also a cracking storyteller. And here she shows us that no matter what we may believe, even those closest to us can have sides to them we never knew about, secrets they’ve been hiding which may only come out once they’re no longer around to protect us or any others affected by them. Letters to my Husband is an impressive debut novel and I’m looking forward to what Stephanie Butland writes next. 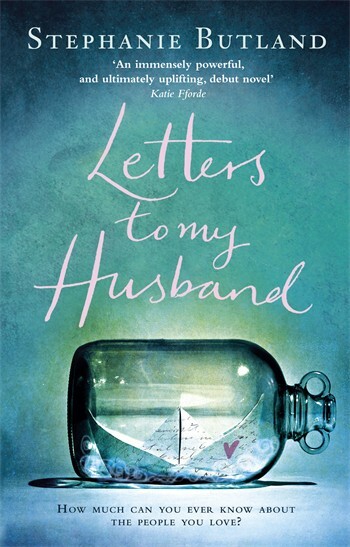 Letters to my Husband is Stephanie Butland’s debut novel and is published by Black Swan, an imprint of Transworld. It’s available in paperback and ebook today from Amazon UK, Amazon US, Book Depository, Hive and Waterstones and was originally published in hardback as Surrounded by Water. To find out more about Stephanie Butland and her books (she’s previously written non-fiction about her dance with cancer), visit her Author Website or Follow Stephanie on Twitter.